Originally from New York City, Chloe Ravel began the first stages of her yoga journey in 2011 while working with inner city youth. With no formal training, Chloe volunteered to teach thirty minute meditation sessions to help foster mindfulness and stress-relief for teens. As witness to the profound effects that meditation and yoga had on her life and the lives of her students, Chloe ventured off to Northern Spain to participate in a spiritual pilgrimage, El Camino de Santiago. This experience of personal growth and reflection inspired Chloe to continue traveling on her quest for self-discovery–eventually drawing her to the South Florida area. In 2013, Chloe began to attend yoga classes at Red Pearl Yoga in Fort Lauderdale where she began to develop an daily asana practice. She instantly felt drawn to the conscious community, and started to volunteer her time off the mat to help around the studio. Encouraged by her teachers and studio owner Karen Gavrilov, Chloe decided to take her practice to the next level by enrolling in the 200 hour Aananda Yoga Teacher Training. Guided by the diverse, knowledgeable, and intuitive instruction of her teachers, Chloe became immersed in a yoga-lifestyle that empowered her to heal, grow, create, and make tremendous strides in her personal and spiritual life. With a 200 hour Yoga Alliance Certified teaching certificate, Chloe is also working toward a Reiki Certification. 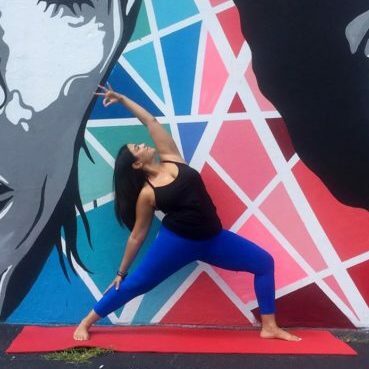 She is dedicated to creating positive and meaningful change in her South Florida community through teaching yoga and fostering healing and connection. She recently launched her own business , The Gemini Rising, creating conscious content for community events and gatherings.